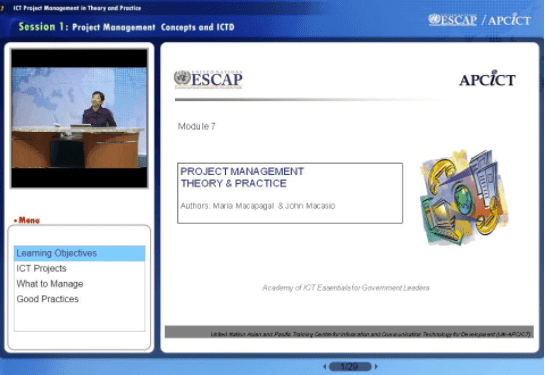 This module provides an introduction to basic project management concepts that are relevant in ICTD projects. It introduces methods, processes and project management disciplines commonly used by development and ICT service management practitioners. Some case studies, practice tools and templates are provided, and the unique challenges of planning and managing ICT projects are highlighted. Describe approaches to and tools for ICT project management. Critically assess the management of existing and proposed ICT projects. Maria Juanita R. Macapagal has over 15 years of work experience in development management encompassing project planning, implementation, monitoring and evaluation, and capacity building in various development fields. She has helped implement institutional strengthening strategies in the private sector and in government and non-governmental organizations in the Philippines and in other parts of South-East Asia. She has also worked as a consultant for CIDA-funded projects, such as the Electronic Governance for Efficiency and Effectiveness project, Policy Training and Technical Assistance Facility, and the Philippines Canada Cooperation Office. John J. Macasio has over 20 years of experience in educational administration and 11 years in managing ICT projects. He has been extensively involved in providing technical advisory services, strategic planning and programme formulation for government agencies, private educational institutions and enterprises. During his tenure with the Philippine Commission on Information and Communications Technology, he designed and facilitated the National Computer Institute's training programmes on e-government, ICT project management and enterprise architecture. He has also been involved in the formulation of National ICT Competency Standards for teachers and government executives.